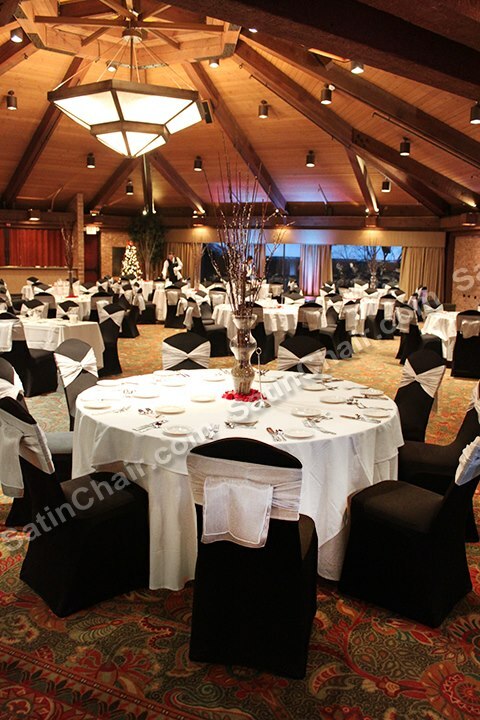 The Chicago area has many unique banquet hall choices for events and weddings, but few have a design and style as unique as Hilton Indian Lakes Resort in Bloomingdale, Illinois. 260 acres of beautiful resort property which includes the 27-hole Blackhawk Trace Golf Course, three additional 9-hole golf courses, golf range, Spa, tennis, mini golf, prairie-style hotel guest rooms, banquet and meeting space, business center, stunning Shiraz on the Water restaurant (not to mention an on-site sommelier and 800 labels of wine and seasonal champagne brunch). The property opened in 1965 with two championship golf courses designed by award winning golf architect, Robert Bruce Harris, and a clubhouse. In 1971 the Carson family (of Carson Pirie Scott department stores) purchased the property, wanting to add a banquet facility. They hired architect and designer Don Erickson, master student of Frank Lloyd Wright, and gave Erickson full liberty and control over the look and design. Initially the engineers fought Erickson on his blueprints and plans for enormous hexagon-shaped rooms with pyramid-shaped atrium ceilings, but in the end, the math and the calculations were in sync… and Erickson’s plans went forward, with truly amazing results and architectural uniqueness. The interior space at Indian Lakes has a wonderfully tropical feel with wood beams, stunning atriums, lush foliage, waterfalls (one three-stories tall), large windows. This resort is unlike most boxy design hotels with rectangular rooms and plain corridors. The Cave Bar is in a setting designed to give you the impression that you’re under a waterfall! The majority of the credit must be given to Erickson, as his master plans and influences created this inviting, vacation-like cottage resort setting. A large project took place at Indian Lakes in 2001 to update the interior of all guest rooms. It was at this time that the rooms were given a Prairie-Style renovation to match the overall look of the property and banquet facility. The Golf Course at Indian Lakes has been updated to suit modern-day golf standards while providing incredibly attractive, yet challenging greens and fairways. Rick Jacobson, renowned for his golf course design plans around the globe, was hired for this project and his amazing talents with premier golf course projects were a key component in the updates done at Indian Lakes. Jacobson has designed many PGA tournament courses and had worked along side Jack Nicklaus for many years. If you love open space and hexagons, loathe rectangles and long corridors, this is the resort hotel for you and your guests! Indian Lakes is located at 250 West Schick Road, in Bloomingdale IL, 30 minutes west of the city of Chicago, south of Lake Street and west of I-355. Planning a wedding, special event, girl’s night out or just a weekend getaway? Event planning services, florists and talented chefs are on site. Indian Lakes has 50,000 square feet of meeting space, a 15,000 square foot vaulted ceiling ballroom to accommodate 1,200 guests, and 14,000 square feet of outdoor space for seasonal event actitvity. 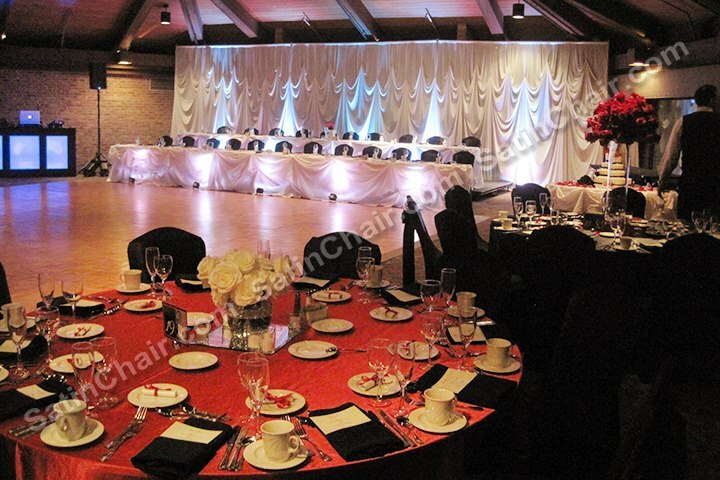 Book your event at Indian Lakes! 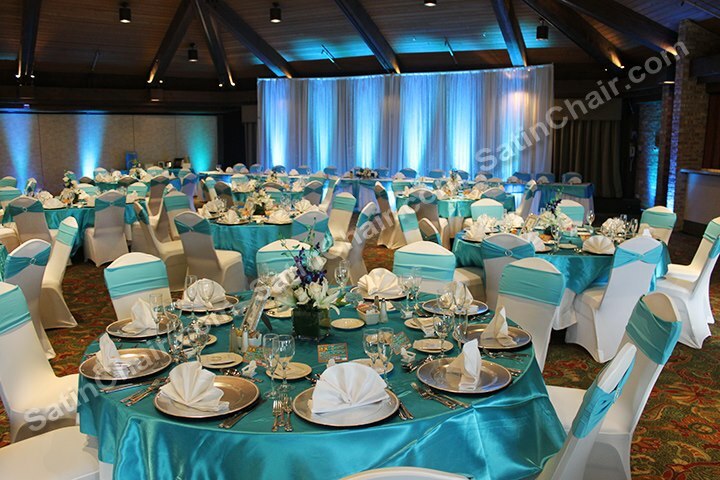 Then, rent your event decorations from Satin Chair Covers Rental! 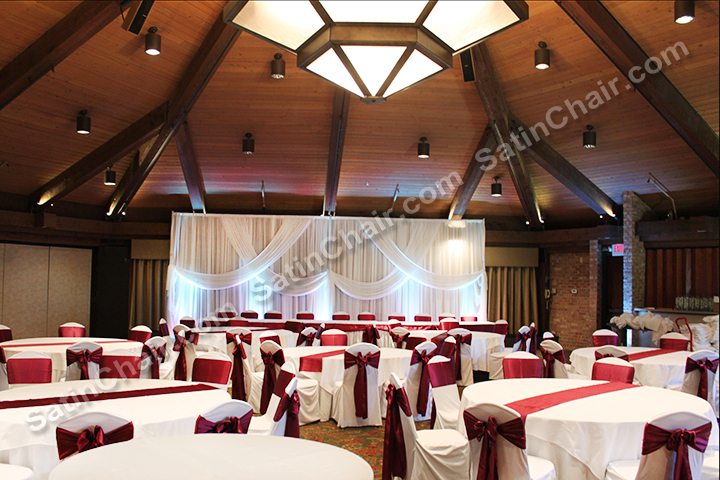 This entry was posted in Uncategorized and tagged "satin chair", 27-hole, architect, architecture, atrium, backdrop, ballroom, banquet, bloomingdale, business, ceremony, Chair Covers, chairs, champagne, championship, chefs, chiavari, chicago, city, decor, event, events, florists, frank lloyd, getaway, golf, golf course, guest rooms, hilton, historic, hotel, hotels, il, illinois, indian lakes, indian lakes resort, lighting, linens, meeting, modern, outdoor space, pyramid, reception, rent, rental, resort, ruched, south, spa, special, style, tennis, unique, vacation, waterfalls, weddings, west, wine, wright. Bookmark the permalink.